RIFT’s Public Test Shard (‘PTS’) was updated on the 27th October 2015 with an ~200mb download. There’s some Mind of Madness (“MoM”) weapons & armor, new MoM achievements and leaderboards. The 7x Autumn Harvest Signet quest is now also up, as well as a new Gloamwood IA achievement. Autumn Harvest Additions. New 7x Signets Quest; New IA Achievement. Mind of Madness Additions. MoM Skins (weapon + armor); MoM Achievements; Mom Leaderboards. Interesting Data Files. Feature Images (MoM + Extra Life); new Amphibious Mounts. Other Info. Credit Pack Promo (Nightmare Thresher Mount); 2nd The Wilds Celebration Pack? Two new additions to the Autumn Harvest world event have popped up on the PTS. As Tacitus mentioned yesterday, Trion will be adding a new quest that rewards 7x Autumn Harvest Signets into the game. [r] The quest has now appeared on the PTS with the latest PTS Update. “Friday Night” is a one-time-only quest available during Autumn Harvest, gained from Rollo in the Realm of the Autumn Harvest. The quest requires you to complete 20x Gloamwood Instant Adventures. This shouldn’t be too hard given that during Autumn Harvest, the Featured Adventure is Gloamwood. Simply go to the Instant Adventure window (default key “.“) and select “Featured: Gloamwood”. A new achievement has popped up under Achievements (default key “h“) -> World Events -> Autumn Harvest called “Things That Go Bump in the Night”, requiring that you complete 10 of the seasonal instant adventures in Gloamwood. These additions are likely slated for either this week’s hotfix, or next week. You can learn more about the current Autumn Harvest World Event here! The PTS has been updated with a few additions related to the upcoming Tier 3 20-man raid “Mind of Madness” (“MoM”). New weapons related to MoM can now be previewed via Wardrobe in your character window. Make sure you have “Show Uncollected” ticked in the Wardrobe window, and type “_” in the search field for any of the weapon slots to view the new weapons. Note: The Mace’s model is missing. The weapons reflect some of the cracked architecture from within the zone. You can see Lead Concept Artist Sven Bybee’s concept art of the new weapons below. From the looks of it, the green sections will probably glow for a lot of the skins. It doesn’t looks like they are in the game yet, but there’s a whole bunch of MoM armor skins that have popped up in the data files. Unsure which pieces relate to which class. The plate pieces probably relate to Warrior whilst some of the others probably relate to Mages and Clerics. Not all skins, just the ones added with the latest update. A new “Mind of Madness” category has popped up under Achievements -> Raids -> RIFT: Nightmare Tide. Has 230pts with achievements from the first 5 bosses in the raid. Some might give any idea of certain mechanics from the fight. There’s also two new leaderboards (default key “;“) for the first two bosses of the raid. Pagura is the first boss you’ll encounter, followed by Lord Arak before you proceed to the three wings of the raid. The Tier 3 20-man Mind of Madness raid will be launching on Live shards in two parts: First 5 bosses some time in November, and last 4 bosses some time December. No exact dates provided yet. You can check out a preview of the first 5 bosses from Trion’s recent Mind of Madness livestream here. There’s a feature image for the upcoming Tier 3 20-man raid “Mind of Madness”. I doubt it’ll appear as a RIFT Store feature, so it’s likely meant for the Welcome Window. The three characters are Enigma (possibly), Lady Justice and Arisen Arak (internal name). These bosses are part of the final 4 bosses slated for the December release. There’s also a feature image for the upcoming Extra Life 2015 24hr gaming charity event. Unknown if this will only appear in the Welcome Window or if some kind of item will be purchasable on the RIFT Store with sales going to the charity. In any case, this is pretty good news in support of Extra Life. Although this year will be Trion’s 5th year participating in the Extra Life Charity Event, in previous years, Trion didn’t really have any in-game information about the event other than the Greybriar “Extra Life” guild and private channel. Not sure what Extra Life is? Extra Life is a charity run to support children by raising funds for the Children’s Miracle Network Hospitals. Each year their main event involves gamers playing games for 24hrs to help raise funds. Trion has participated in Extra Life every year ever since beta of their first game, RIFT. Last year they raised just over $100,000 for the charity. Each year, Trion starts a team with a variety of fundraising milestone rewards, contests, a 24hr livestream and a variety of giveaways and participation rewards. There’s usually also special in-game events or activities for their various games. For RIFT, previous years had a special guild on Greybriar, player-run contests, titles, Corgi Rifts, Sheep Rifts, teleports to a special ‘dev island’ and a player sheep run through Mathosia. You can learn more about Extra Life 2015 in our full guide here. You can also check out a summary of 2014 and 2013! Consider donating to Extra Life to help the kids! The Boar mount is the Razorback, and I assume those have swim animations so they don’t need Underwater Mount Training. ‘Gargazelle‘ is the internal name for the Vaiyuu mounts. Afaik there are no Amphibious Vaiyuu mounts in-game. Perhaps we’ll get one for the Fae Yule world event this year (coming some time in December). ‘Kontartula‘ is the internal name for the spider mounts. Again, don’t think an amphibious one exists in-game yet. Perhaps they’ll make Spinderella amphibious? ‘Manslaughter‘ is the internal name for the Empyreal Walker mounts. Again don’t think any existing ones are amphibious. ‘Floating StormLegion‘ is the internal name for Cyclone/Volt/Jolt-style mounts. Again, no amphibious on Live yet afaik. Yarnosaur mounts becoming amphibious either applies to all Yarnosaurs, or only to the Primal Warbeast mount, which uses the Yarnosaur animation/skeleton rig. Tiger mounts are not currently amphibious on Live. For some of these, they might become available to upgrade to Amphibious via the Underwater Mount Training item found under RIFT Store -> Mounts, or perhaps they are animations for special Premium mounts that either exist now or will be added in the future. In any case, looks like Trion has been busy adding swimming animations to a bunch of different mount rigs! There’s a new Credit Pack Promo on the PTS. The $100 Credit Pack gives you a Nightmare Thresher Mount that is an account-wide unlock. The Nightmare Thresher is an Amphibious mount that has 155% mount speed, or matches your fastest mount. This Credit Promo has occurred in the past as well. 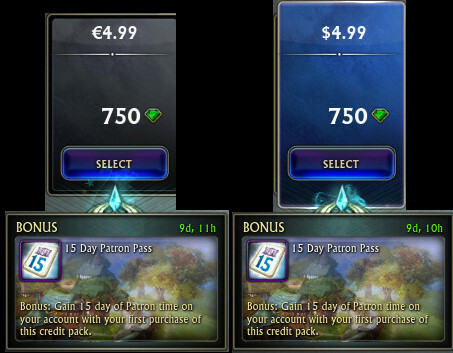 Do note that this promo is on the PTS, which means that it isn’t guaranteed to appear on Live shards (like the previous $5 15-day Patron promo). That said, keep an eye out if you’re after the Nightmare Thresher mount! This is the 2nd time my character has received this pack. Eligibility for the pack will end on October 30th 2015. [r] However, Trion has not mentioned anything about getting the Pack twice. However, who knows – keep your eye out, especially after this week’s reset or after the hotfix just in case Trion has decided to give us the Pack again! New Autumn Harvest quest with 7x Autumn Harvest Signets; new Mind of Madness skins and a Credit Promo in the latest PTS Update. Look forward to the latest additions coming to a Live shard near you, at some point in the future! Hey Khortish, would you mind revealing what costume your toon is wearing (in the MoM weapon screenshots)? Thanks! I’m using the Devious Jack o’ Lantern Mask (head); Arboreal Wings (cape); Riding Jacket (chest); Melodias Leather Gloves (gloves); Butler’s Dress Slacks (legs); and Silverwood Defender’s Boots (feet). Dyes are Exceptionally Black and Dark Ruby. Are we expecting new items purchasable in the store? In terms of Autumn Harvest? Probably not. In terms of MoM? The armor sets will likely appear for some form of raid currency-only when Tier 3 comes out as the new Tier 3 store-bought gear. Tier 2 armor will likely have a Credits option added in once Tier 3 comes out. As for weapons, those are likely the models for the raid-dropped weapons. 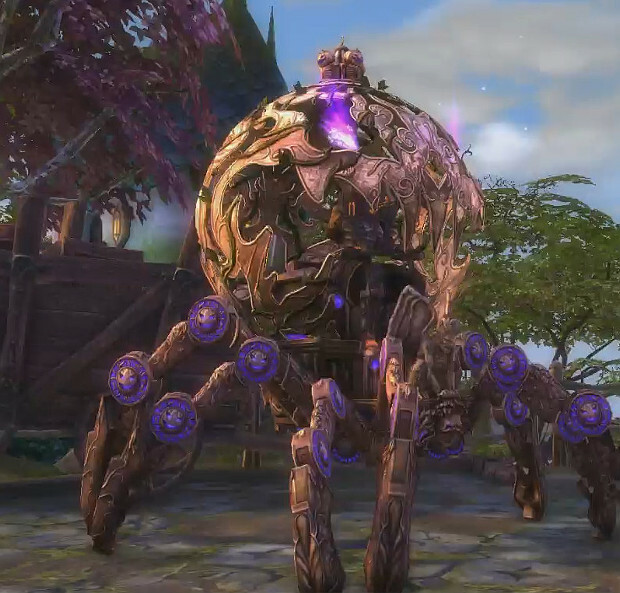 Trion usually holds back a few months for new, purchasable weapons.